Mom. Dad. Don’t read this one. The Fist of Jesus is based on an independent short film, and it probably should have stayed there. It’s another game that I would consider a novelty title. Without the presence of Jesus, I’m almost certain this title would have been received with universal negativity. As the port of a mobile game, the fighting mechanics are extremely limited. One button does all the punching and kicking, while the other face buttons trigger special attacks that would normally be activated by an on-screen button. Because there’s only one button for attacking, there’s no combos or advanced moves to pull off. Just mash the button until the person you’re punching is dead. Alternately, sometimes your punches randomly stun the enemy and make a meter appear. Press the meter at the correct time and you’ll unleash one of three finishing moves chosen at random. The finishing moves are the same for both Jesus and Judas, and the novelty of watching Jesus rip out the heart of a zombie gets old pretty quickly. Question: why would ripping the heart out of a zombie kill it? It’s a zombie. Its heart doesn’t even beat. Oh, never mind. I remember now. It’s because we need to have screenshots and videos of Jesus ripping out someone’s heart and holding it up triumphantly like he’s Mola Ram so that people will want to buy the game. The movie Fist of Jesus is fifteen minutes long. I put fifteen hours into Fist of Jesus: the PC game. That wasn’t enough to finish it. I’m stuck on the level 50 boss, which is an encounter with a giant octopus, because why not? By this point, you’ve already fought it a couple of times, but this time around, it’s ultra spongy. I never got killed against it. Instead, I died when time ran out. 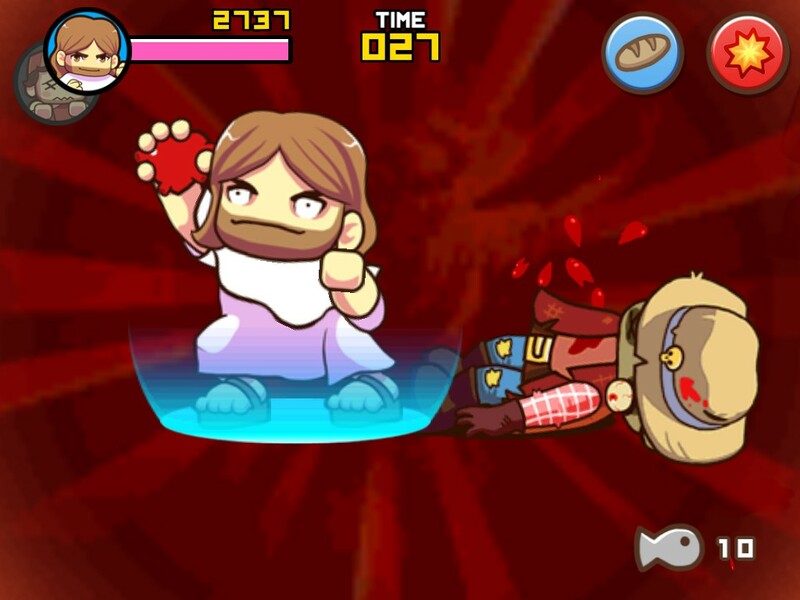 Here’s where Fist of Jesus shows its ugly mobile roots. The game is too padded and has too much emphasis on grinding. I *did* level and money grind quite a bit before I got to it. I had found the perfect level to do so and thought of myself as quite clever. I was wrong. Despite having gained an extra five or six levels doing this, I wasn’t remotely close to beating the octopus on stage 50. Even with 500 seconds, and that I had spent a couple of hours screw-grinding my XP, and even considering that I hit it every single time it poked its head out to open itself up to attack, AND even considering that I had purchased all available upgrades, AND had unlocked all the XP based upgrades, AND purchased the right to start the stage with a gun, I could only knock down three-quarters of its lifebar before time ran out. That’s simply too damn spongy a boss for a game with fight mechanics as shallow as a puddle of spit. Like many ports of mobile games to PC, I think the developers of Fist of Jesus made a mistake by porting the game straight to PC without optimizing the controls or the mechanics for the platform. The game would have had more value if they had taken advantage of the more advanced capabilities PC has to offer. Slightly more complex fight mechanics, a larger variety of attacks, or especially the ability to play this co-op would have helped Fist of Jesus greatly. The rush to port the mobile game to PC feels a bit lazy. I controlled the action with an Xbox One controller, but needed to switch to the mouse and hold the left button down to scroll the map. There’s an on-screen indicator that dialog could be skipped, but I was unable to do so with the controller or the mouse. These are all niggling annoyances, but I couldn’t help but wish more effort was put into this game. Especially since so many people would buy it just for the novelty value. To anyone who is offended by this picture, I just want to point out that some people might be offended by your beliefs. You know, according to your religion, the penalty for not combing your hair is God will kill you AND be very angry with your neighbors for letting you be such a slob. I’m not kidding. Look, it’s right here. And really, that’s what Fist of Jesus is about. I never got the feeling from it that it was meant to be a good game. It’s a novelty. “Hey, look, there’s Jesus kissing Judas to bring him back to life, like he’s Sleeping Beauty. There’s Jesus ripping the head off a zombie. 9 out of 10! Eleven gold stars! I can’t wait to show this to my friends!” I don’t get it. The whole “taking a character out of their element is funny in and of itself” joke wears thin so fast, because once you’ve seen Jesus rip out one heart, you’ve seen the entire punchline. Hey look there’s Jesus, doing something very un-Jesus-like! L out L! But really, people have been doing the same gag with Jesus for decades now. South Park had him as a main character on the show, and gave Satan the Disney Princess song in their movie. Is sacrilege funny by itself anymore? Apparently so, judging by how many people liked this game. And maybe as a fifteen-minute-long movie, the joke works. But I think games need to be something more. This one is normally priced $9.99 too. That’s just too damn expensive for a fifteen-plus hour game where the gag stops being funny about five minutes in. Fist of Jesus is a game. As a game, it just isn’t fun. I can’t stress enough, I spent hours grinding, and there’s no challenges left for me to do except beat this boss. But, what I’ve done isn’t enough to beat the boss I’m on. I have to go back and grind the same small handful of enemies, using the same handful of weapons, until I have enough strength to beat it. Or I can quit and play a better game. Yea, the shock value will never wear off with certain people. My parents are practicing Catholics, and my mother walked in on me playing Fist of Jesus. The look on her face was priceless. I don’t think she could have been more disappointed in me if she had walked in on me getting an abortion. But what’s in it for you if you have nobody in your life to offend with this? One of the dullest brawlers I’ve played and a one way trip to Hell, which will probably be spent playing Fist of Jesus. $4.99 (normally priced $9.99) said “The Fist of Jesus” was the wrong name for this title. It should have been “The Power of Christ Compels You to DIE!” or something less generic in the making of this review.